Filmfood: Sophia Loren & Marcello Mastroianni in "A special Day"
Sophia Loren & Marcello Mastroianni in "A special Day"
Rome during the late 1930s, the day Mussolini and Hitler first meet. Left alone in her home while her fascist husband runs off to attend the historic event, Sophia Loren strikes up a friendship with her homosexual neighbor Marcello Mastroianni. "This is my most beautiful film". 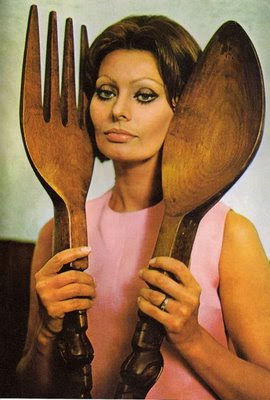 Sophia Loren is more than a beloved movie star, she's also a passionate cook. Her first recipes appeared in her 1971 cooking book 'In Cucina con Amore'. (published in English as Eat with Me). It's not so much about the recipes, but most beloved for the wonderful photos of Sophia hiding amongst Italian delicacies.